A room without windows, shackles on a bed without escape, a house without hope, Peter Straub’s follow-up to lost boy lost girl takes us back to Millhaven Wisconsin, back into the company of novelist/detective Timothy Underhill, and back to Joseph Kalendar’s horrific house in Pigtown. 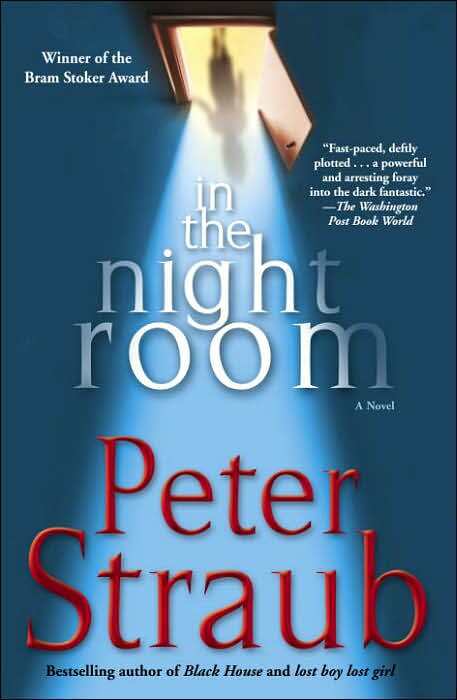 Although in the night room follows parts of the same storyline as lost boy lost girl I hesitate to call it a sequel. In lost boy lost girl we followed reoccurring hero Tim Underhill as he ventured home to his grieving brother after his sister-in-law commits suicide due to a sighting of a tortured little girl’s ghost. Shortly after his mother kills herself young Mark Underhill (Tim’s nephew, for those who aren’t paying attention) becomes obsessed with the house directly behind his where a killer by the name of Joseph Kalendar raped and murdered multiple women with the aid of his son. On the back of the house Kalendar built a small lean-to type room in which he imprisoned his daughter. The house was also built with multiple passage ways behind the walls so Kalendar could give his victims false hope that they could escape while he moved around within the walls chasing them. The house is now owned by a totally different whack job named Ronnie Lloyd-James. Soon after his obsession begins Mark Underhill disappears. The book I’m actually going to talk about, in the night room, starts off with Tim Underhill back in his loft in New York City attempting to pen a new novel after finishing his last lost boy lost girl (in the world that Underhill exists he has penned many of Straub’s novels working with him at times). His novel is interrupted when he begins to receive e-mails with no domain because they are coming from the dead he used to know and headed by one who calls himself Cyrax. Spliced in with Tim Underhill and his haunted MS Outlook is the story of another novelist named Willy Bryce Patrick in New Jersey. Willy’s daughter and husband were murdered before the book began and now she thinks she hears her daughter crying for help behind locked doors of a warehouse. She begins to suspect that her current fiancé, Mitchell Faber is somehow responsible for the deaths of her husband and child. Tim Underhill is confronted with a fan—reminiscent of Annie Wilkes from Misery—who hints of a secret book every author produces without knowing it. The fan, Jasper Dan Kohle, buys multiple copies of Underhill’s last book lost boy lost girl in an attempt to find this perfect book, or does he? Looks are deceiving and anagrams abound as Kohle begins to stalk Underhill. If you know of Tim Underhill he’s not the lay down and die type. Chasing after his would-be stalker Underhill is confronted with a pissed off angel named WCHWHLLDN. Cool, huh? Willy Bryce Patrick’s fiancé Faber sends his goons out to catch her when she finds out the truth about him. Running from them she finds herself at a book signing in New York for none other than Timothy Underhill. Okay that wasn’t much of a surprise. It is for Underhill though, who will have to test his sanity (not to mention his homosexuality) after meeting Willy. According to Cyrax, Tim and Willy have to venture back to the horrible house of Joseph Kalendar in Millhaven and put right what Underhill (and possibly Straub) had wrong in lost boy lost girl. Since Underhill/Straub drew false conclusions about Kalendar and the fate of his daughter Kalendar became so enraged he found a way back into Underhill’s world in various forms. Using the guise of seeing his brother’s second wedding Tim and Willy travel back to confront his mistakes. As always, Straub paints a tale so realistic you wouldn’t be surprised if the characters stepped out of the book and began walking around your home, well maybe a little surprised. At the same time he paints his canvas with realistic imagery he blurs the lines that separate realities for his protagonist. It is an interesting study for the responsibilities writers have not only to the story but to the characters in it. This is why I belabored the preceding book in the beginning of this review. I can’t say I had a great deal of love for lost boy lost girl. The writing was excellent and the story moving (the pacing was a bit inconsistent) but the conclusions drawn seemed hollow and confusing. Whether this was a follow up or a correction of the previous novel it stands excellently on its own. I also like how the supernatural has begun to sneak into Tim Underhill’s world. If you are a fan of Straub’s or his character Underhill you’ll love this new edition to the story of Tim Underhill. I give this 5 out of 5 slashes to the jugular.